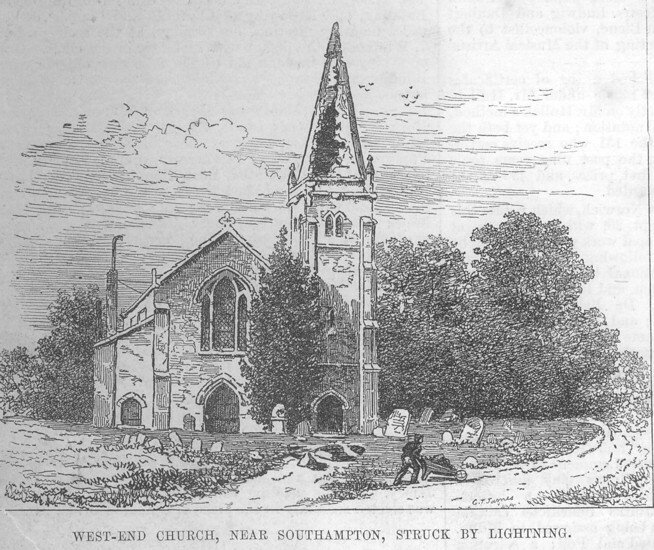 The neighbourhood of Southampton was visited on Saturday week, early in the morning, by a violent thunderstorm. It did considerable damage, including the destruction of a tall chimney at the London and South-Western Company's engine­station at Northam, and the partial demolition of the spire of West-End Church, about four miles from the town. The spire was an octagonal one of brick and stucco. The lightning took it on the south angle, carrying away the vane and a portion of the top stone, and laying the whole side completely bare, the south pinnacle also coming down in the general downfall. The fabric was left in a very dangerous condition, especially in the high wind that on Saturday followed the storm; and it is probable that what remains of the spire, which is a sight really worth the journey to see, will have to come down. The nave and aisle roofs were damaged by the falling bricks from the spire.